V60 Team. 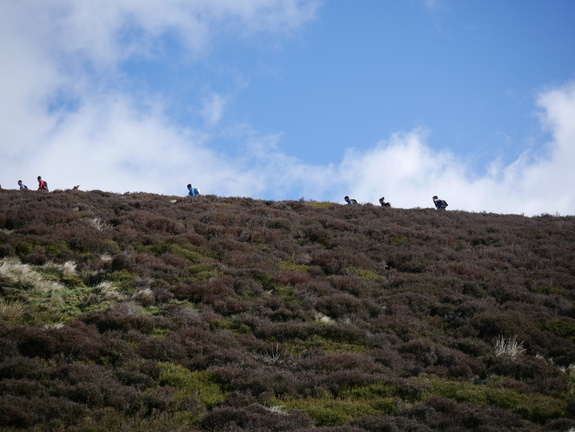 Our good friends in Pennine mention:-"In addition to Dark Peak, Pennine and Cheshire we need a 4th team to commit so that we get the required 4 teams competing. It. would be beneficial to all of us old guys if any one could gee along other teams to commit to the English Championships. Of particular note is that only 3 teams have secured teams on the Edale Skyline so we need a 4th team to register on Buttermere as the 4th competitive team on the required Long Race. Registration opens on March 1st, so if we can ask people in the other Clubs we would all be in for a mutually very satisfying special year - Rn Rees"
Bleasdale Circle – around the Bowland fells…Results. A most rare occasion, a team of three at this race, Dicky and Kieran Davis. Another gem of fell running, swampy fields before and after, with a steep climb and mad hurtle somewhere in between. Parbold Hill - results. John Hunt is 1st V50, in 48mins 22secs. Stybarrow Dodd – the second Carshare League event…Results. Ilkley Moor:- results. This was also the Yorkshire Championship race, and congratulations to Nathan Lawson, 1st MU23, and Ellie Crownshaw - 3rd WU23, not to ignore Rob Little, in 6th place. For some reason the recorded times don't seem to show seconds, only minutes.